Being dependent on oxygen doesn't mean your life is over. Happy Day After April Fools Day! I’ve never been into the whole “April Fools” thing since the time my little sister wrapped a raw egg in foil and put it in my bed while I slept. Yep, I rolled over onto it and the egg broke, leaked egg guts and made a mess in my bed. Yuck! So, April Fools? No thank you! haha! K and I have been BUSY lately. My garden is growing like crazy! We have little tiny cherry tomatoes growing (3 of them…wow!) and my potato plants are getting huge. I even ate my first strawberry from the garden and it was DELICIOUS! So sweet! Yes, I shared it with K. I didn’t really want to because it was so good but there was only one berry and it would have been rude of me not to share. Right? I have to let you know. I AM A PLANNER. I like researching things I want to do so I know what I’m doing once I start a project. K is the opposite. Kind of. So, it took us a couple of tries to stack the flagstone to make it look almost the way we want it. Let me tell you… those are so heavy! K did all the hard labor but I still wanted to help with some of the physical stuff. I tried moving the flagstone and after four stones, I was done. K told me to go sit down. I like being involved in our house projects. The way I was involved was helping pick out the type of stone, fish, and planning how the pond will look. K wanted to name the goldfish with Beatles names. Ugh! Really? I named one of the goldfish, Thunder! K named one of them White (not Whitey, he says)… So, I call him White Ghost because he’s an all white fish. Clever, I know! We have a total of 8 fish. 5 small goldfish and 3 medium goldfish. It was hard to get K to wait until the water was ready for fish. Bamboos just added my dream pond. I also have 9 flowers on my lemon tree! NINE!!! Please don’t fall off… Please don’t fall off! I even caught a sale at the grocery store for fresh green beans! Late last night, I washed and blanched them so that I could freeze them. They are so much better than green beans from a can. Blech! I only wish that I had bought 2 bags of them instead of one. Darn it! Yes, life is good. I have things to look forward to every day. Feed my fish, check my garden, and pray for lemons to produce on my Meyer lemon tree. Hooray! All these things help keep me happy which distract me from bad breathing days which is awesome. I hope life is going well for all of you. Can’t find what you’re looking for on my blog? Search for it here. -What do you mean 24/7? -Meet Christine – my 1st video! -Which one? Living or Existing? -Flying.. is it becoming an option again? -How to make your oxygen using guest feel comfortable in your house. Many times I get stopped by people I don't know wanting information about the oxygen that I use. They ask: "Why do I use oxygen at such a young age? What kind of tank are you using for your oxygen?" But really, my favorite questions are from little children who see me walking around with a tube in my nose. 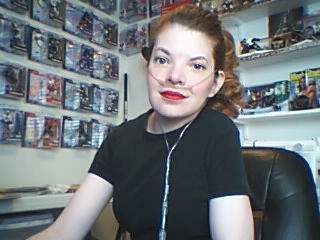 I want to let people know that even though those of us who use oxygen, whether it's part of the time or all of the time, our lives are what we make it. I strive to make my life the best it can be. Life is worth living no matter what our challenges are. My challenges sometimes get me down but I don't let them keep me down. I wear a smile and look forward for those happy days and those happy memories I make with my husband. I need advice… and an update. Make, contain and freeze meals… our new adventure! My Rookie Experience in Trying a New Thing and How to keep life interesting. With the new year… it brings changes. Crazy Awesome Weekend with Family! Little emergencies can be big problems.